Do you want to know the best place to see penguins in South America? Chile is one of the best places to see penguins in the wild. 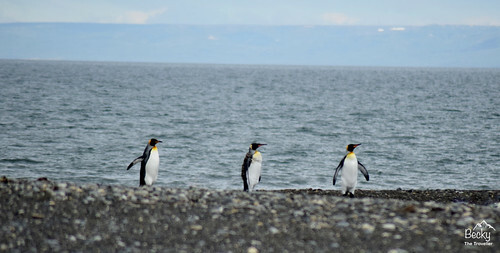 So if seeing King Penguins in Chile on your bucket list then be sure to stop off to visit them here. I would love to see every species of penguin in the world. 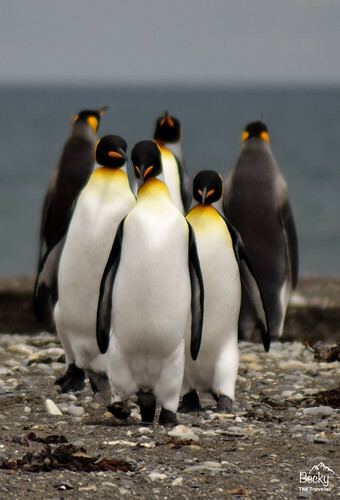 So far it’s three species, Little (or Blue) Penguins in Australia, Galápagos Penguins and of course, the King Penguins in Chile. 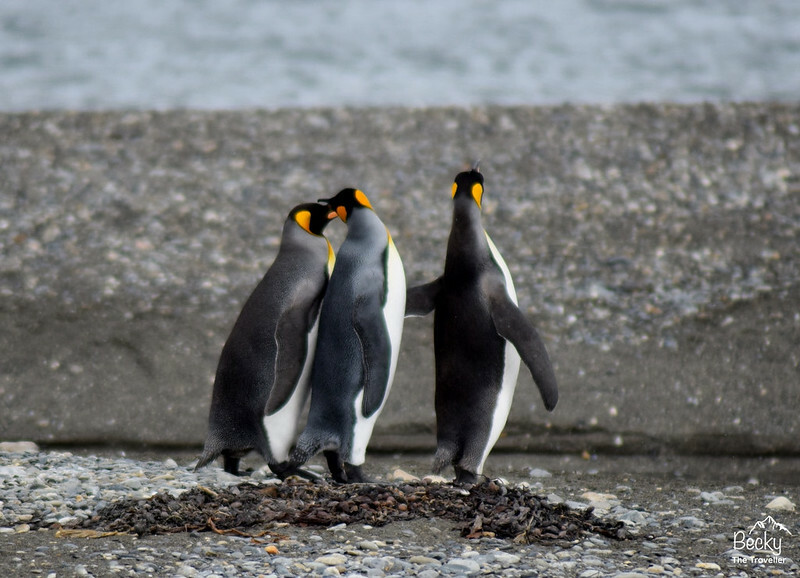 Here I will tell you about one of my favourite wildlife experiences, meeting the King Penguins in Chile. If you have time to fit in on your South American trip then it’s worth the visit, especially if you are a penguin addict like me! My Patagonia trip with Tucan Travel included spending 3 weeks travelling around beautiful Chile and Argentina. But the main reason I had selected this tour was that it included a penguin stop on the itinerary. You have to know where your priorities are!! 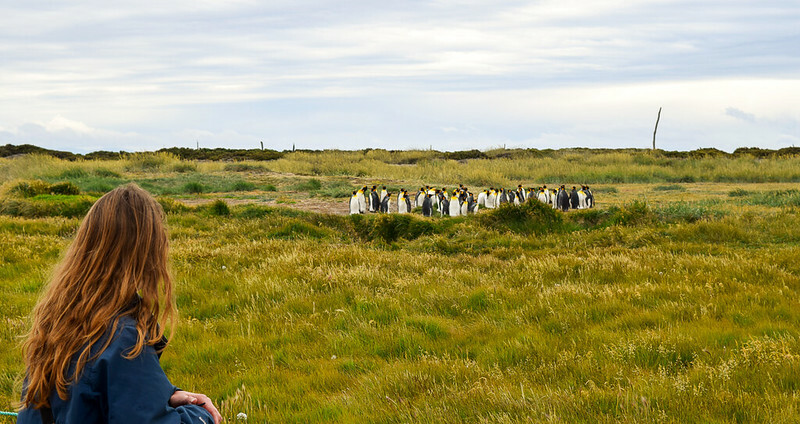 Read about my awesome experience seeing the penguins in Chile to ensure you don’t miss out. Also includes top tips for your penguin visit, where to see them, why I chose this penguin park and useful information. 1.2 The Best place to see so many King Penguins! 1.3 Why chose Parque Pingüino Rey in chile? 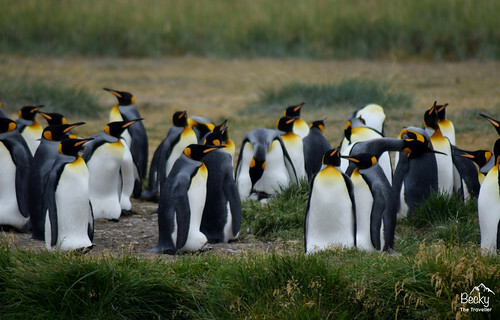 An encounter in the wild with King Penguins was one of the highlights of my trip to Chile. There’s something about their comedy clumsiness on land that puts a huge smile on my face. Then in water, they swim effortlessly (I was lucky enough to snorkel with a penguin in the Galápagos Islands). It is an amazing thing to see with your own eyes. Day 1 during our tour welcome meeting, we were told the Magellanic penguins in Chile we were due to visit was no longer an option. But, we had an option B. 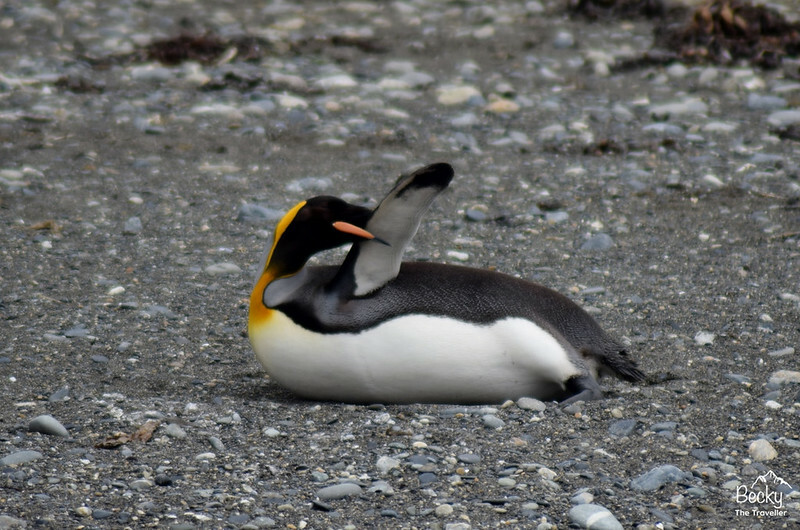 To drive an extra long day and visit a King penguin colony. Everyone in the group agreed. And I was even more excited…. King Penguins, I was going to see King Penguins!!! The barrier that prevents you from getting close but it’s close enough! After a really long drive. I can’t remember how long as I fell asleep, but it was several hours we arrived at Parque Pinguino Rey (King Penguin Park). I’m not sure what I expected but it was a small area with a few cabins and toilet. Anyway, I was here to see King Penguins, not the facilities! I patiently listened to the briefing talk. Then we were split into two groups to watch the penguins at two different places. The main colony and the beach. As I was walking down the path it was important to keep really quiet and move slowly so as not to alarm them. I vividly remember walking closer towards the penguins and inside I wanted to break into a run, but that’s a big NO! I managed to keep calm enough until I reached the penguin colony. The Best place to see so many King Penguins! Our group went to the main colony first where the King penguins were hanging out, doing not a lot to be fair!! There were over 50, I couldn’t believe my eyes, I never expected to see that many. The penguins were grouped close together and you could actually see them balancing eggs on their feet. It was amazing. After seeing so many I didn’t think it could get any better. But when I swapped to go to the beach, the penguins seemed to be putting on a real show. Walking up out of the sea, three penguins caught my attention. They followed each other up until for some reason the one in front stopped suddenly and the other two crashed into him. It was like something out of a comedy sketch like they didn’t have any brakes top stop themselves. Capturing the penguins crashing into each other! As well as those three, there were numerous King Penguins lying on their tummies, scratching their wings and generally being pretty awesome. As we were part of a group and still had to drive to Tierra del Fuego. After an hour at the penguin colony, it was time to leave. I genuinely could have stayed and watched them all day. Looking at the photos takes me back to that moment in an instant so for me it was totally worth the visit. Why chose Parque Pingüino Rey in chile? Parque Pingüino Rey in Chile gives you an amazing chance to get up close with these beautiful birds in their own habitat. However, they, more importantly, promote the protection of the penguins and conservation of the area. Now if you’ve done your research you might have read reviews on Trip Advisor that say you don’t get close enough to the King penguins in Chile. But for me, it’s more important not to disturb wildlife that is in its own environment. Treat yourself to a good camera instead! The only downside is that the park is a considerable drive in Chile. But for a penguin lover like me, it was all worth it. Plus I wasn’t driving haha! Enjoy the experience – it’s great to capture the moment but it’s not all about the photos. However, if you do want to take photos I would recommend a zoom lens. Visit the main colony but remember to pop and visit the beach – this is where all the action is happening! Binoculars would be handy if you want to see the penguins closer. Remember not to disturb the penguins, keep quiet as you don’t want to spoil the experience for anyone that’s visiting. Do you want to know about my experience seeing penguins in Chile? Where else have you seen penguins? Ask me any questions in the comments below. Hey Becky! This kind of thing would be up my alley too – I honestly love scenery and nature and I will do anything to have these kinds of experiences. I heard King Penguins can be up to 1 or 2 metres tall, is that true? I love penguins!! I actually have a small penguin that I bring with me on my travels and take photos of (he has his own Instagram). This must have been a fantastic experience for you, and I will absolutely head that way when I visit Chile! I love everything about this post! I never even knew visiting penguins in Chile was a thing! That’s incredible! I’ve only seen the little blue penguins in Australia, but now I want to see them all! This is so cute! I love penquins too and in love with all of your photos in this blog. Thank you for sharing this – Chile is on my travel list! Beautiful! I didn’t even know you could see penguins in Chile. This definitely made me put Chile on my bucket list! I didn’t know there are king penguins in chile! So just how far away can you see them from? Since you mentioned big zoom lens. So cute! I got to hang out with penguins in South Africa and I didn’t realise how adorable they would be. Will definitely need to see them in Chile. Your pictures are so great! This is amazing! It’s totally going on my bucket list for South America. Hi Becky lovely post and great photos! I too am a big penguin lover and I am heading there this year! May I know what is the focal length of the lens you used? I have a 70-300mm lens and I wonder if it would be adequate.